Quinns: Heya Matt. What’cha reading? Matt: It’s Second World War Infantry Tactics by Stephen Bull. An excellent introduction to the infantry doctrine adopted by the antagonists of that famous conflict. I picked it up because it’s listed in the bibliography of this game, Band of Brothers: Ghost Panzer. Quinns: Oh my god! UNDEAD TANKS? Matt: …No. 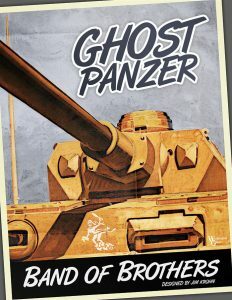 Ghost Panzer is the sequel to Band of Brothers: Screaming Eagles which was about the 101st Airborne of televisual fame. This one concerns the exploits of the 11th Panzer on the Eastern Front, and they get their name from the spectral stencil they sprayed on their vehicles. It’s all in the bibliography. Quinns: A game with a bibliography? It’s not the sexiest of selling points, but what the hell! Let’s play! I’m not sure you can work for SU&SD if you turn down games. Matt: I’m not sure I’ve known a game like this before. Ghost Panzer claims to offer a more realistic depiction of Eastern Front infantry combat than most other games by removing rules. This is clearly nonsense: you can’t possibly make a game more realistic by making it more abstract. The game, therefore, must be flawed. It’s the only explanation. So I refuse to play it more until I’ve read this book and proved the game is wrong. Matt: Alright, it does seem to work. 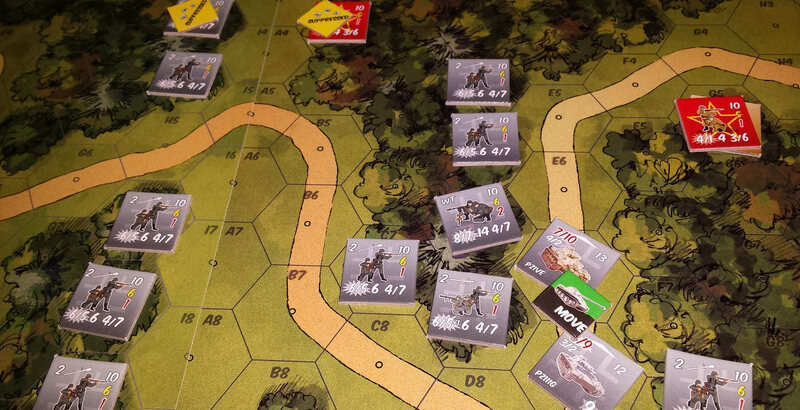 There are only 16 pages of rules and while they’re not laid out brilliantly, and there’s a confusing bait and switch where vehicles work rather differently from infantry, it’s not hard to learn. When you’ve got the hang of it, it plays like lightning, thrilling blow for blow stuff, communicating the sense of urgency that a good tactical game should. And when you apply historical tactics, they seem to do well. But … it just can’t work. There must be a flaw somewhere. You don’t add realism by simplifying. Quinns: I don’t know. I can kind of understand that. 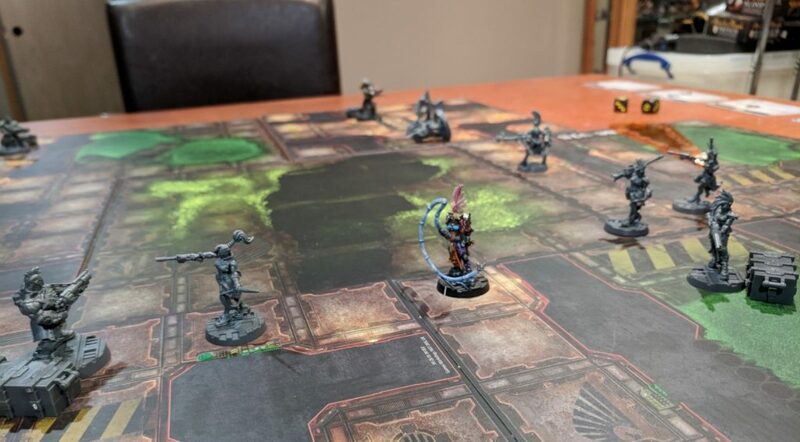 The simpler a game is, the more room there is for players’ imaginations to take over, and the less likely it becomes for a rule to poke out from the game’s fabric like an errant spring from a cheap mattress. Matt: I suppose. But you see, in most tactical games, when a vehicle gets destroyed, it leaves a wreck which makes good infantry cover. That’s realistic, right? But if you then give a player a low-value vehicle like a truck there’s a temptation to drive them at the enemy, expecting them to be destroyed, to give your advancing troops something to hide behind. So in Ghost Panzer, there are no wrecks. 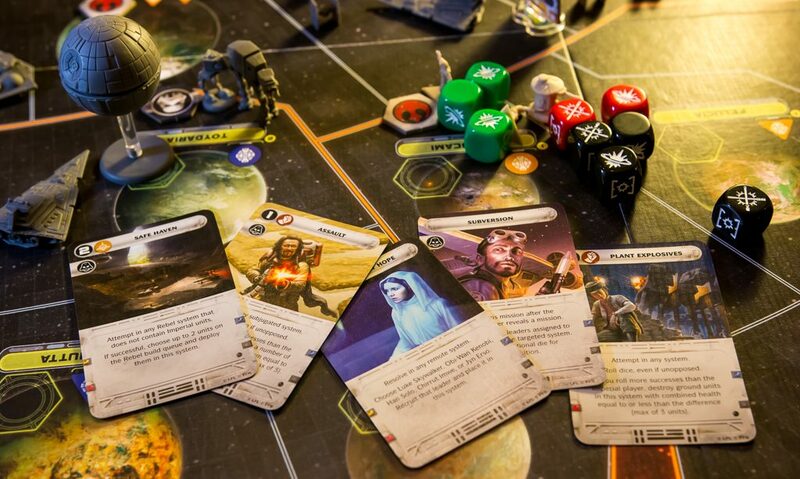 Fewer rules, less realism on the battlefield, but the players adopt more realistic tactics. Quinns: Aha! Yes. 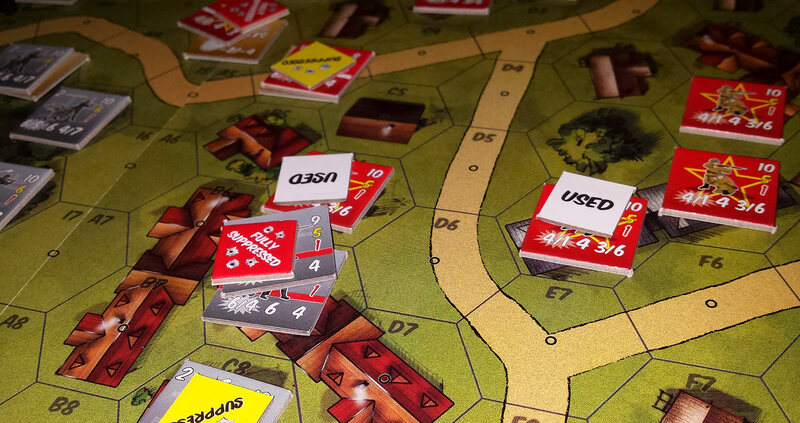 So in shovelling all the detail out of the way, historical strategies become more viable. I heard the same think about new videogame Drive on Moscow. Matt: Precisely. Small actions in the Second World War were famously all about the “four F’s”: find the enemy, fix him in place with fire, flank him and finish him. And the game replicates this in astonishing clarity with its bizarre “realism from abstraction” approach. Once you’ve understood how the game works then, just like any game, you’ll get your units on the board and start making plans for victory and adjusting them on the fly as the situation changes. It’s only once the game is over that you’ll look back and see that you were naturally setting up bases of fire, pouring ordnance onto enemy units until they’re all suppressed, and then advancing through the windows of peace you’ve created to assault objective hexes. Just like a textbook infantry training exercise. Abstractions go in, realism comes out without you even realising it. It’s just astonishing. But, like I said, there must be a flaw somewhere … if I can just find something in this book the game doesn’t replicate, I’ll have it and all will be well with the world. Quinns: So, aside from being a fundamentally impossible object in our reality, does it have any actual problems? Matt: Curiously, the biggest issue is that reality turns out to be less fun than you might imagine. As you work through the scenarios you’ll discover that the same find, fix, flank and finish strategy is almost always best: that’s what actually worked given the weaponry of the era, so it’s what everyone did. 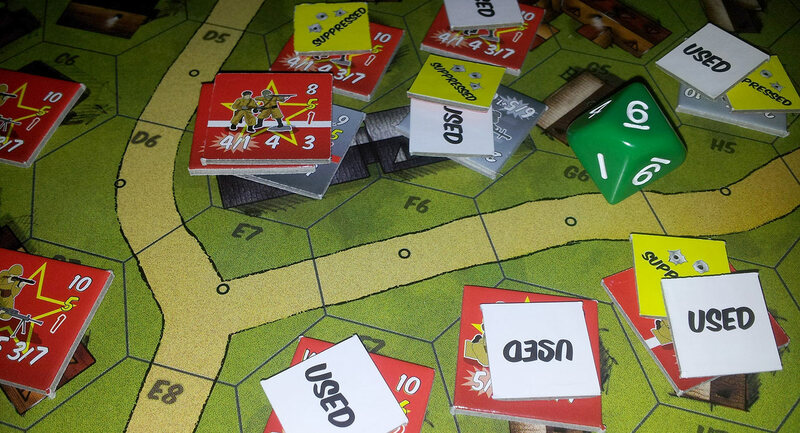 There’s plenty of tactical adjustment to make as the dice fall and things go awry of course, so it’s not overly repetitive. But sometimes you find yourself looking for a gamey mechanic to game, because we’re gamers and that’s what we do. Quinns: Sure. 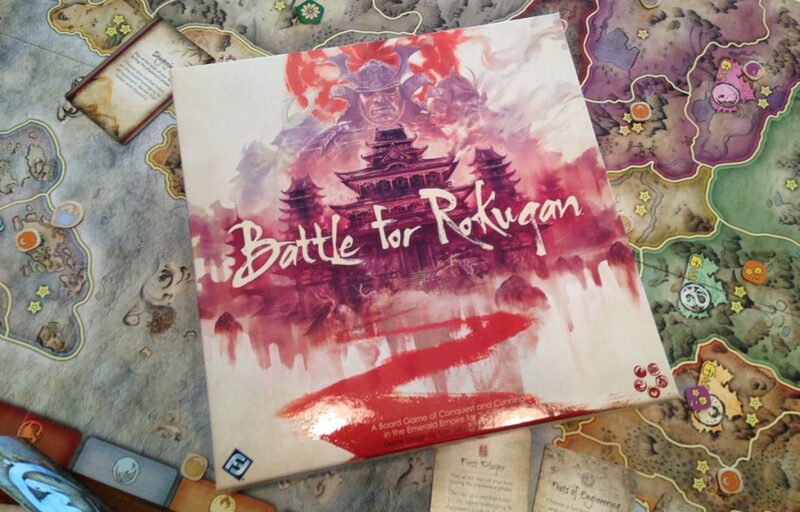 But wargamers who want an actual game are already pretty well catered for. Matt: Well, sure. You know, I’d probably be more lenient if Ghost Panzer could possibly be both realistic and simple at the same time: which, of course, it can’t. And the streamlining process has squeezed out the rich detail you get from games like Combat Commander: guns don’t jam, units don’t stumble into hidden wire, and snipers don’t pop up and blow officers away. Quinns: But there are still some surprises? Matt: Oh yes. There’s a system of dummy counters which is a bit fiddly, but utterly nerve-wracking as you chase what could be shadows, or could be heavily armed Panzergrenadiers, through the houses. And there’s still plenty of narrative. The first time I played with vehicles, a Panzer rumbled out of a forest road and into the muzzle of a hidden Russian anti-tank gun I’d failed to flush out. It was like a frozen movie still, as the shell roared out and panicked troops waited to see if the armour would survive the impact. Matt: No. And we didn’t have to rummage for a wreck counter as we carried on. 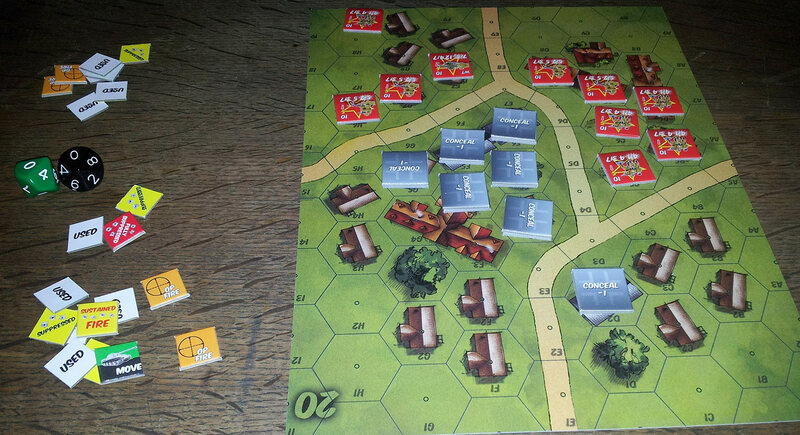 That was down to one dice roll and it could have gone either way, but that swinginess is characteristic of the game. Suppressed troops have to test morale in order to act, and that means you’re never truly safe. Sometimes that MG nest you thought was buttoned down will pluck up the courage to suddenly open fire and tear your advancing squads apart. But it works for me: it lends delicious tension to proceedings, and war shouldn’t ever be truly safe. Quinns: In other words, the game’s succeeded yet again at being disturbingly realistic, and also pretty fun? Matt: Yes! I mean no! There’ll be a chink in the Chobham somewhere, you mark my words! Although I’ve got to say the morale system is pretty clever. It irons out some of the oddness you often see in tactical games which reward concentration of fire and madcap dashes across open ground. Here, you’ll need to spread out your targets and getting caught in the open is outright murder. GODDAMMIT! Matt: I can’t find anything in this book to contradict the game at all. And that was the last book on the reading list! Quinns: You’ve been reading WHILE WE WRITE THIS? Matt: I’ve had it. 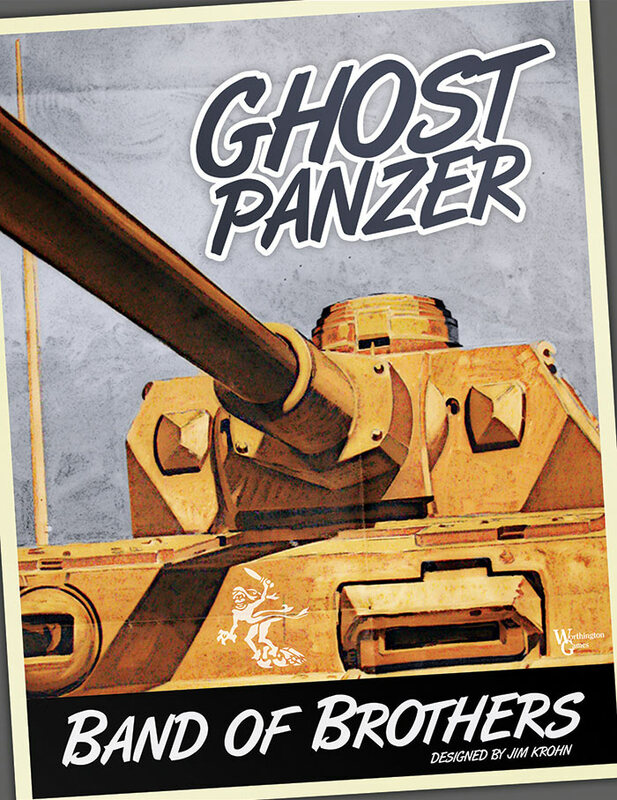 Ghost Panzer is an anomaly, an oxymoron, a paradox that can’t possibly be real. This box I’m holding does not exist. There’s nothing left to do except stare at it until it goes away. Quinns: Until what goes away?